It is thrifty too! I got all my stuff from the Dollar Store! 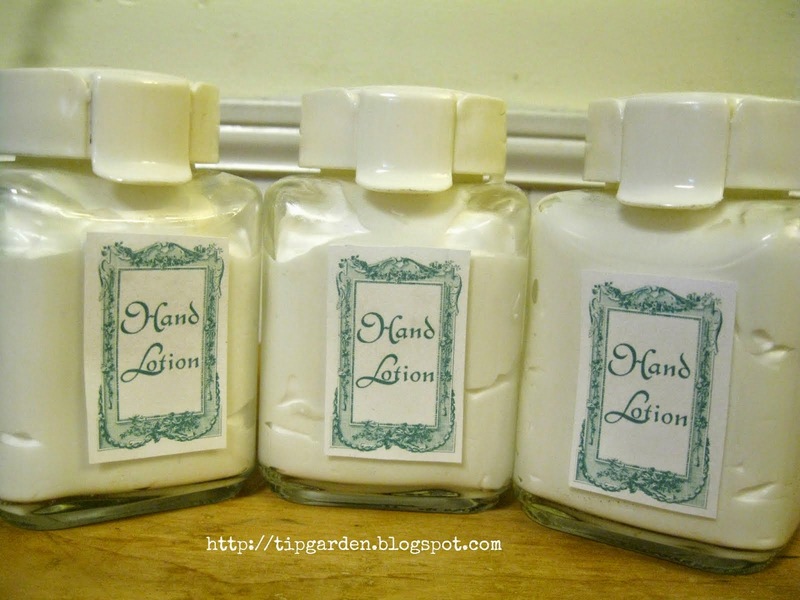 There are a ton of recipes for making your own hand lotions or creams and they are all wonderful, but I just don't have time in my crazy life to be tracking down ingredients from different stores or sources, so I came up with my own. It will only take you like 5 minutes to make these gifts, yet they have that "Wow, you make your own lotion?, what a thoughtful gift!" reaction from the recipients. Feel free to play around with the idea and customize the "recipe" to suit your own preferences. Jan's Tip: I chose to use 2 (10 oz. each) Tubes of the Dermasil Lotion because I felt it was a better quality than the more generic 20 oz. bottles of lavender or aloe, or cocoa butter. Feel free to use any lotion you want to. Optional add-ins: or in place of any of the above ingredients: Vitamin E. oil, coconut oil (it has the consistency of shortening), aloe, jojoba oil, etc. 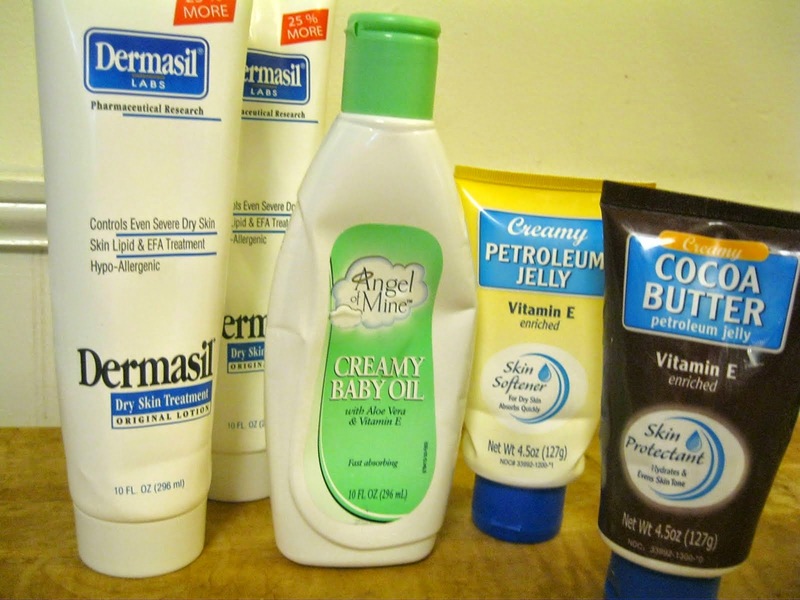 Jan's Tip: Creamy versions of Baby oil, petroleum jelly (Vaseline) and Cocoa Butter Petroleum Jelly all have the look and feel of a lotion. They are not the original versions of thick, clear jelly or runny clear oils you might be familiar with. Look for the word CREAMY on the packages! If you are worried that the creamy baby oil might make the lotion too "greasy" I don't find the finished product to be sticky or greasy, it absorbs into your skin fairly quickly, but not instantly so if you are concerned you can leave it out. A word about adding fragrance: Many people like myself are sensitive to fragrances. They trigger migraines for me. If giving gifts I generally don't add fragrance oils, but if you do want one, go with a soft vanilla. Your instinct may be lavender, but that is a huge migraine trigger for many people, so just a suggestion to consider! If you use your own jars you only paid $4.00 dollars total and got anywhere from 3 gifts to maybe 5 or 6 gifts depending on the size jars you use! so that's less than a dollar a gift, yet it is sooooo cute! I mean how else can you spend less than $5.00 on supplies and make a ton of cute gifts in 5 minutes flat! That's what I call, cute, thrifty and swifty! WHAT WOULD YOU MIX IN TO YOUR CUSTOM LOTION?